Winemaker’s Notes: True to its nose, robust flavors of berry cobbler and black cherries swirl with notes of mocha and deep spice, punctuated by medium-firm tannins on the finish. My Review: If you’ve ever been to a Total Wine (and let’s be honest, love them or hate them, you’ve been to one), you know that they regularly have tastings of wines that they’re either promoting, have been asked to promote, or, as I sometimes suspect, that they’re just trying to get rid of. That’s not to say that all of these wines are bad, or that you can’t get a good value on them – coupons are typically offered on tasting wines. During a run to grab beer for backyard projects, I took the time to run through a tasting of several red and white wines that had found their way onto a table with some of those aforementioned coupons. 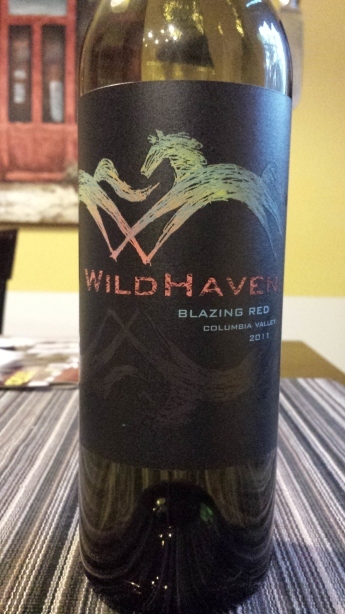 Several stood out (two came home with me), and I recently opened up the 2011 Wildhaven Blazing Red to pair with some dinner…and to share with my wife that wasn’t with me and didn’t get to taste the wines. In the glass the wine was a nice dark garnet red, while on the nose I picked up dark berry and cherry aromas with just a hint of spice. In the mouth the wine showed good body, with a pleasant blend of the dark fruit notes from the nose with a bit of mocha thrown in to the mix. Paired with a dinner of steak and a couscous salad the wine did a nice job of matching up to the red wine. The medium-body of the wine was good with the red meat, but still enjoyable by itself, with the berries having just enough brightness to them when the wine was first opened to be nice for sipping while dinner was cooked, but mellowing out as the wine opened and dinner was ready. I really enjoyed this wine – my only complaint is not knowing what’s in the bottle beyond Merlot; the pourer at Total Wine claimed it was a Merlot-based blend and nothing I can find indicates that it’s either A)anything but merlot, or B)what besides Merlot is in there. Either way, an enjoyable wine, a good value, and one worth keeping an eye out for.